leaving them sparkling clean with minimal effort. The gel's deep penetration allows for effective cleaning and descaling in one application. Phosphate-free and contains biodegradable ingredients. Not for use on natural stone surfaces. Do you have a dozen different cleaning supplies under your bathroom cabinet, crowding your limited storage space? Most of them probably contain harsh chemicals and some may not even work that well for cleaning stubborn dirt. Blue Diamond All-in-One Bathroom Cleaner is a thick, concentrated solution that safely cleans bathroom bowls and basins without strong fumes or dangerous muriatic acid that eats away chrome and metal fittings. Its special formulation allows for deep penetration into surfaces, eliminating odor-causing bacteria and germs as well as dissolving rust stains, hard water scales and soap scum. • Toilets: Squirt a light stream over the inside bowl area, spreading around the bowl and under the rim with the Ergonomic Toilet Brush. Allow to work 3 to 5 minutes then flush clean. Wipe bowl exterior and seat with a Norwex cloth. • Baths, basins, shower stalls: Pre-wet surface. Apply a light stream on surface and immediately spread with a Norwex cloth. Rinse thoroughly. 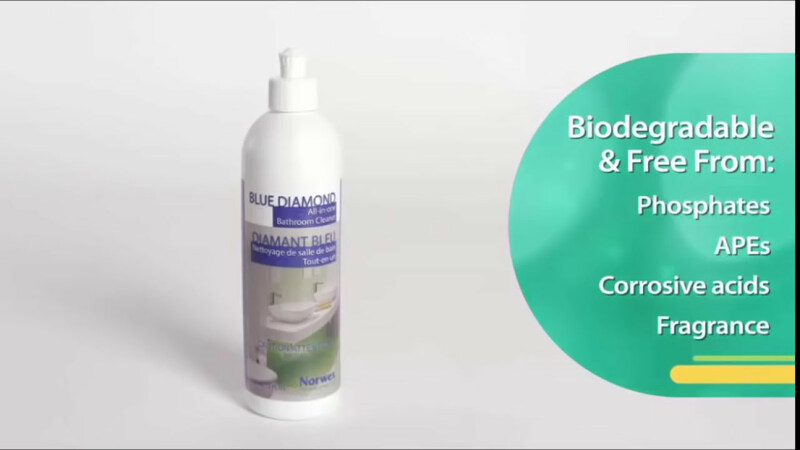 • On porcelain surfaces: Dilute 1 ounce of Blue Diamond with 7 ounces of water before using and rinse immediately. • Not for use on natural stone surfaces. • Do not use on polished marble, aluminum, galvanized zinc, tin or magnesium surfaces. If contact occurs, rinse immediately. • Thick solution clings to all vertical surfaces to penetrate deeply for a fast, effortless clean. • One product does it all, saving you money and valuable under-the-counter storage space! “Scale” or limescale, also known as calcium carbonate, is the milky white substance that can collect around faucets and drains. It results from mineral deposits left by hard water, and it’s difficult to remove without using abrasives, which could damage the finish of the surface. The natural organic salts and citric acid in Blue Diamond make it just right for the job!